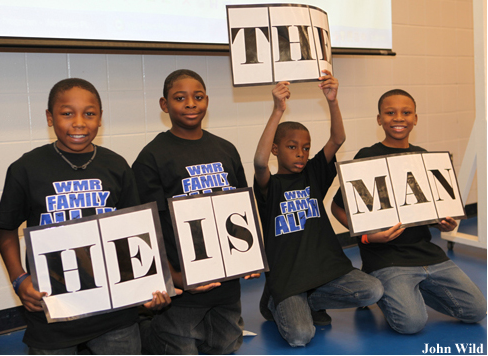 Four Wright's Mill Road Elementary School students mentored by Cam Newton pose at the school's "Cam Day" assembly last December. Cam Newton hasn’t forgotten Wright’s Mill Road Elementary School. In April, the No. 1 draft pick participated in a 30-minute conference call with the four Wright’s Mill Road students he mentored each week last fall. “I gathered [the boys] in my office and he asked them how their grades were doing, how their behavior was, and just holding them accountable,” said Wright’s Mill Road principal Lynda Tremaine. Newton last visited the school in December before the Heisman Trophy ceremonies. Wright’s Mill Road faculty surprised the eventual Heisman winner with an assembly in his honor, thanking him for his volunteer work and wishing him well on his trip to New York. Newton later donated the $200 fee he received for his December appearance on the Late Show with David Letterman to the school. Tremaine said Newton had a wide impact on the school. “He just made it such a special year for everybody,” she said. Tremaine said Newton plans to visit the school when he can. I am going to miss Cammy Cam. I already miss Cammy Cam. Just makes you wonder where some of the reporters leading up to the draft got their information on him. He seems like a pretty genuine person to me. Cam will be alright,he got a good heart, there are some hater out there.Cam heart is in the right place, CAM wil be just fine. Look at thing Cam is doing for a lot are kids an what have Cam did was so bad Cam is a good person.Hold your head up Cam Ibelieve in you, God bless you.